All we know Android phones are plays an important role in our life. Sometime our smartphone volume keys will be damaged or not working properly due to different reasons. At that time you will not be able to control volume of your Android phone. This article helps you to control volume of Android phone with Volume ChopCUT App. Lot of Android phone uses press volume keys too much either playing the game or listing the music. During playing the game or listing the music volume keys of your Android phone are broken or not working properly. Due to which hardware problem your Android phone are not working properly or sometime volume keys are broken. You have to use Volume ChopCUT App which enable you to control volume of your Android phone. The Volume ChopCUT is a simple app that easily control volume of Android phone with Volume ChopCUT App. When your Android phone volume keys are broken then you are not able to increase or decrease the volume of your Android phone. This article helps you to solve your problem how to control volume when of broken volume keys of Android phone. There is no need to buy the new Android phone when volume keys of your phone is broken. The Volume ChopCUT app is free to use app of Google Play Store which not only control the volume button of your Android phone but also provide different features. The Volume ChopCUT app is already download by different Android users. This app occupied 3.6MB space on your Android phone. If you want to install this app on your Android phone then you must need 4.0 or upper version of Android phone. The Volume ChopCUT app has 4.3 user rating. 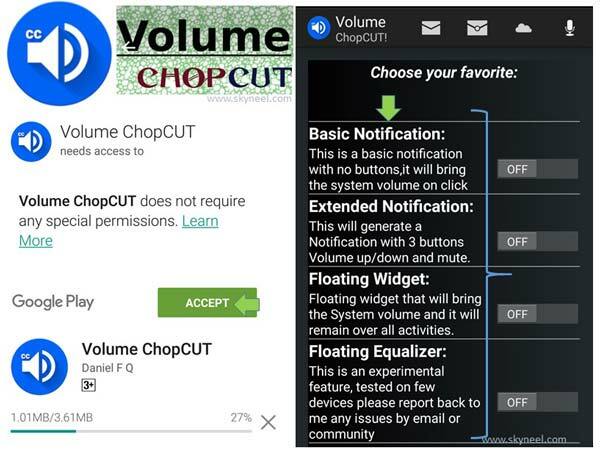 You have to click on given link to download Volume ChopCUT app from Google Play Store. Basic notification allows you to select any required option and check on the notification panel. You have “Media volume”, “Ringer Volume”, “Alarm volume”, “Call volume”, “All Ringer/Alarm/Media”, “All Ringer/Alarm/Media/Call and All Ringer/Alarm/Media with buttons. You can also disable notification bar icon on your Android phone. Extended notification generate notification with three buttons. You have to choose any required option and check your notifications panel. You will be able to increase or decrease the volume as per your need. The floating widget feature allows you to add any widget that drag and float on your Android phone. It has different options and choose any floating icon as per your need. You have to set or change the app icon for control the volume, alarm, ringer and call. The floating equalizer is an experimental feature which gives you different equalizers for control. You will be able to easily turn on or off the equalizer as per your need. This feature allows you increase or decrease the volume of bassbost. All these feature of Volume ChopCUT make it an interesting app. With the help of these features you will be able to easily control volume of Android phone with Volume ChopCUT app. After reading the article you will be able to easily control volume of Android phone with Volume ChopCUT app. If your Android phone volume button is broken or not working properly then this article will be helpful for you. If you have any suggestion regarding this article then write us in the comment box. Thanks to all.